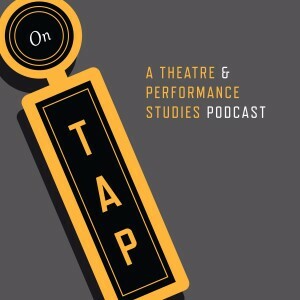 On TAP is a new podcast dedicated to theatre and performance studies. Practically, it’s a downloadable audio chat show hosted by three professors, Sarah Bay-Cheng, Pannill Camp, and Harvey Young. Each episode looks at a variety of topics of field-wide interest, new ideas in research, trends in the profession, pedagogy, artist/scholar dynamics and recent events. In some ways this enterprise is very conventional in 2015. There are tens of thousands of podcasts, and after the success of programs like Serial, about half of Americans know what a podcast is. In other ways, though, On TAP feels like a fun experiment. How will this non-traditional medium fit with the established modes of communication that permeate our field? Can we translate the pleasure of the conference hotel bar chat into a form that someone would want to listen to? Simply, if we build it, will they come? Part of the initial impulse for creating this podcast was, unsurprisingly, the pleasure of podcasts themselves, which are steadily reaching more people. Pannill has been an avid podcast listener since 2007, when a handful of downloadable audio programs helped him pass a lonely year of dissertation research in Paris (very sad, we know!). About two years ago he began to imagine the possibility of adapting the Slate.com format (three co-hosts discuss three topics in a casual, hour-long chat) for the field of theatre and performance studies. Last summer he made his pitch to Sarah and Harvey, and was thrilled that they were willing to dedicate their time and energy to the project. But more than just for fun, the podcast seems well-suited to our field; a dynamic, collaborative, social medium is a good match for theatre geeks of all types. It’s a little bit rebellious, too. Like those of many academic disciplines, most of our interactions are orchestrated within established institutions: universities and colleges, publishers of books and journals, and associations that organize conferences. These organizations create and disseminate high quality research, facilitate communication among people with overlapping interests, and advocate for the professional well-being of scholars, teachers, and artists. They work well, and Theatre and Performance Studies is a growing, dynamic field that is holding up relatively well against the economic and cultural forces that are decimating other disciplines in the humanities. However! There are two patterns that can slow down and even stifle field-wide communication. First, it can be challenging for scholars to keep up with ideas that are circulating outside of our particular areas of interest. A great wealth of research is published year-round, but the pressures of specialization, and the mounting administrative, mentoring, and teaching duties typical of work in today’s academy make it hard to keep up with what is being written. Second, the rhythms of field-wide communication are slow. We inherit our cycles of contact from the creeping pace of peer-reviewed journal and book publishing, from the quarter, semester, and year periodization of teaching, and from the yearly cycle of conference planning. Compared to the accelerated rhythm of mass communication in the digital age, this pace of work is positively glacial. We thus offer On TAP as complement and corrective to the traditional ways we theater/performance academics interact and share ideas. Working on a comparatively short cycle (roughly monthly releases during the academic year; one or two days from recording to release) and with a broad field-wide perspective, we hope to offer a new mode of communication that is both immediate and more inclusive. We also aim to incorporate the best parts of theatre and performance into our work: dialogue instead of lecture; improvisation instead of carefully planned remarks; and the pleasure of a good joke or bad pun. We hope listeners will come to think of On TAP as a unique and sometimes irreverent way to gain both a bird’s-eye view of the field, and a sense of what is on people’s (or at least our) minds at the moment. We hope you’ll join us soon.